Sabre #23651 is on loan from the Canada Aviation and Space Museum in Ottawa, Ontario. North American Aviation started to design the F-86 Sabre in 1945, using swept wing technology captured from the Germans. The XP-86 first flew in October 1947 and it exceeded the speed of sound in a dive in April 1948. 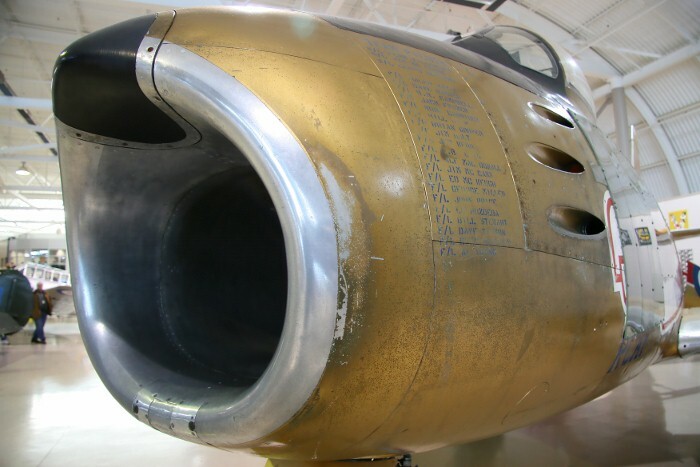 An early production F-86 broke the world speed record (671 mph) later the same year. During the Korean War, US Air Force F-86s shot down over 790 Russian MiG-15s, with few losses to themselves. 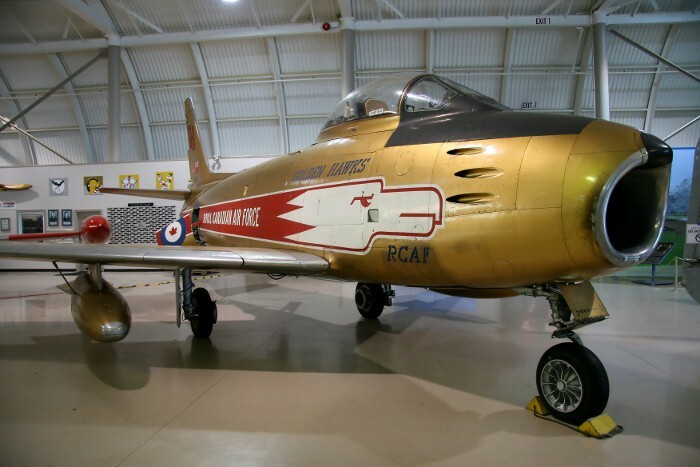 In 1948, the RCAF chose the F-86 Sabre as its next day fighter. The aircraft was to be built in Canada by Canadair in Montreal. The prototype flew from Dorval in August 1950 and production started (Mk. 2) soon after in the fall. 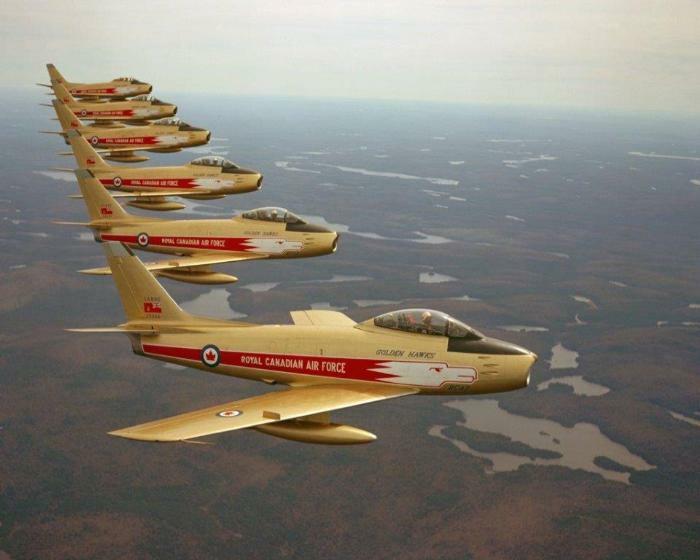 The Sabre entered RCAF service in the spring of 1951 and equipped nine squadrons serving in both Canada and Europe. 350 Mk. 2s were delivered to the RCAF during 1951-2. The RAF ordered 370 Sabres from Canadair in 1951 and, as the RCAF required additional fighters, an improved version (Mk. 4) came into production. Eventually 438 Mk. 4 Sabres were built. Most Canadair Sabre Mk. 2s and Mk. 4s served with the 2nd Tactical Air Force in Europe. The RCAF wanted the Orenda engine installed in the Sabre from the start. Consequently in 1952, the Sabre Mk. 3 was developed powered by an Orenda 3 engine. In June 1953, this aircraft piloted by the famous Jacqueline Cochran broke three air speed records at Edwards AFB, California. All Sabres built between 1953 and 1958 (Mk. 5 & Mk. 6) were powered by Orenda 10 or 14 engines and both versions served with thirteen RCAF squadrons in Europe and Canada. 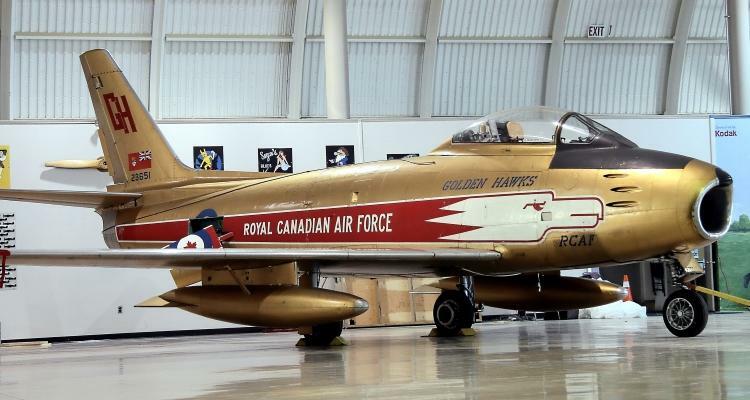 The Canadian public best remembers the Sabre as the aircraft of the RCAF Golden Hawks aerobatic team, which gave spell binding flying displays in the 1960s. The RCAF retired the F-86 Sabre from fighter operations in 1963, but continued to use it in other roles till 1968. A total of 8861 F-86 Sabres were built between 1947 and 1958; 1815 of them in Canada. The Museum's Sabre Mk. 6 on display was built in 1956. 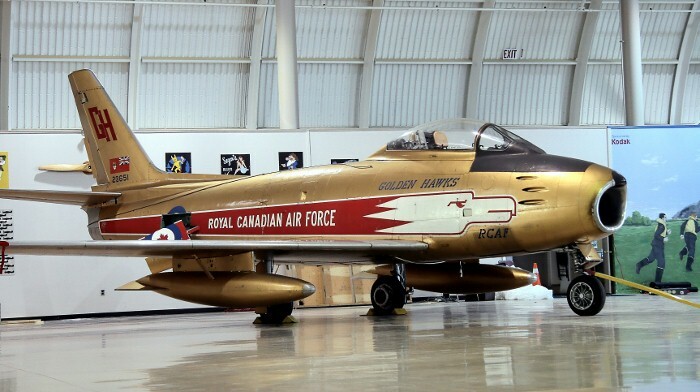 It flew with the RCAF in Europe for six years and then with the "Golden Hawks" for the 1963 airshow season. The National Museum of Science and Technology in Ottawa acquired it in 1964. It has been modified with clear panels down the left side of the fuselage to show its interior construction. The Sabre is on extended loan from the Canada Aviation and Space Museum in Ottawa.